Above: Cunard's Queen Mary 2 is the fastest major passenger ship in service. However, as Cunard underscores, she is an ocean liner, not a cruise ship..
Below: NCL's Norwegian Gem may be the fastest cruise ship. Above: Royal Caribbean's Radiance of the Seas and her three sister ships are also very fast. Below: Captain Herman Zini has commanded Radiance and her sister Brillance of the Seas. Above: The sleek bow of Jewel of the Seas, one of the Radaince class ships. 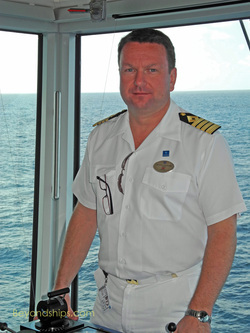 Below: Captain James MacDonald of Jewel of the Seas. For many years, the speed a passenger ship could travel was very important. It indicated how fast you could get from here to there and how advanced was the ship’s technology. The major lines competed to build the fastest ship and it was a great source of pride to have the world’s fastest ship. In fact, to have your country’s flag flying on the ship that held the Blue Ribband (awarded to the ship that had done the fastest crossing of the Atlantic) was a matter of national honor. With the coming of the commercial jet airliner, speed became less important. There was no way a ship could compete with the speed of a jet aircraft. Furthermore, since the first purpose-built cruise ships were designed to do lazy circuits of the Caribbean, there was no need for speed. Indeed, officers on Queen Elizabeth 2 sometimes joked that their ship could go faster in reverse than some of the new cruise ships could go forward. Today, a ship’s speed is rarely emphasized. When I do interviews, the ship’s officers will usually point out that fuel consumption increases almost geometrically as you increase speed. With the high cost of fuel ($500 a ton on a recent cruise on Explorer of the Seas), you do not want to increase consumption any more than is necessary. Therefore, the ships are designed to travel at a speed that allows them to do their desired itineraries in a reasonable time. Still, the passenger ships of today are significantly faster than the cruise ships built in the 1970s and 1980s. Whereas those ships generally had top speeds of 15 to 20 knots, today, there are very few ships in the fleets of the major lines that have a top speed of less than 20 knots. Moreover, as seen below, there are several ships that can go significantly faster. 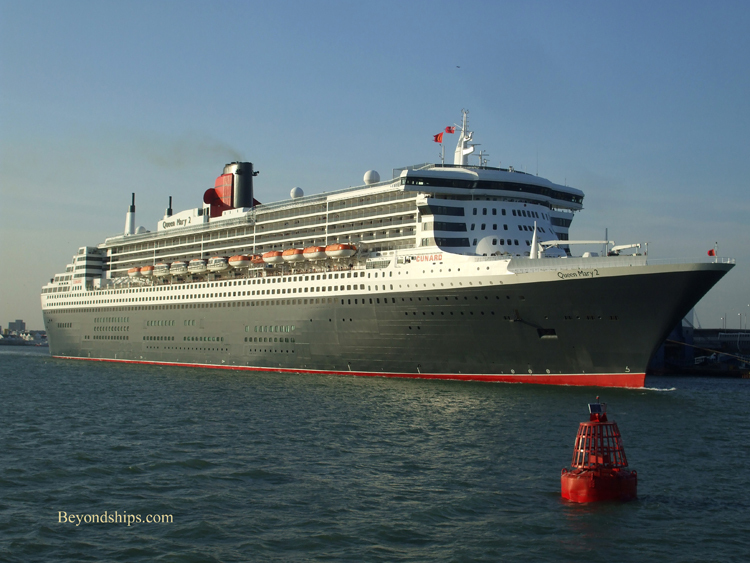 The fastest ship in service today is Cunard’s Queen Mary 2. Designed as an ocean liner, she needs speed in order to handle the variable conditions of the North Atlantic. Her official top speed is 28 knots but the ship has done close to 30 knots. The fastest cruise ship - - as opposed to ocean liner - - that I have encountered is Norwegian Gem. Captain Roger Gustavsen reports: “She can do 26, maybe 27 knots.” Furthermore, she makes use of her speed. Based year round in New York, the ship runs at high speed in the winter down the East Coast so as to get the passengers out of the cold and into the warmer weather as quickly as possible. Thus, the speed is used to enhance the passenger’s cruise experience, which in turn makes cruises on the Gem more attractive. Another time the ship’s speed is used is for medical emergencies. I was on the Gem during one cruise to the Bahamas when such an emergency arose. The ship had spent the day at NCL’s private island Great Stirrup Cay and was due to arrive in Nassau the next morning. This is only a short distance of about 100 miles and ship was virtually drifting along. Then the captain announced that a passenger was ill and required hospitalization. Accordingly, Gem was brought up to full speed. Standing on the outdoor promenade, one could see that the ship was racing through the clam waters and feel the increase in the wind. Soon, the lights of Nassau appeared. When we arrived, one of the cruise ships that had called at Nassau that day was still in port. It was an exhilarating ride. And, yes, the ailing passenger was disembarked into a waiting ambulance. Royal Caribbean lists the Radiance class as having a “maximum cruising speed” of 25 knots. However, as Royal Caribbean’s Chairman and CEO Richard Fain has written: “We always expect that the unexpected can be expected to occur. For cruising speed, we measure the speed of the ship using only 78% of [full power].” Thus, the Radiance class ships are capable of going significantly faster than 25 knots. The Radiance class ships have been used as pathfinders for RCI to open new markets. For example, Brilliance of the Seas has been sailing part of the year out of Dubai recently. In addition, their speed enables the Radiances to do itineraries with more ports than slower ships.